Of the multitude of fabrics offered for sale; the miles of natural, man made and combination material, linen is surely the most ancient and certainly one of the most enduring. It is strong, long lasting and attractive and though it has certainly ‘had its day’, it is still popular for its character, coolness and practicality. Admittedly, I do not possess much in the way of it. My linen collection is small and entirely seasonal although this is rather common, and indeed customary, for those even in ownership of overly substantial wardrobes. Linen, like silk, is a minor feature in the gentleman’s clothing closet. 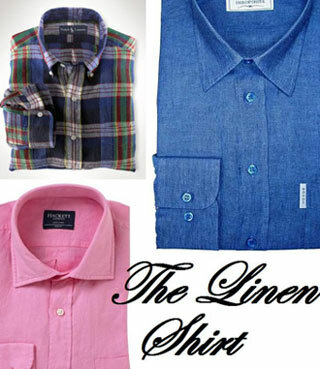 The years when fine white Irish linen shirts dominated the fashionable scene are gone; linen is now seen as a novelty. Compared to cotton it is expensive and, though certainly stronger, less manageable. The crumpled linen shirt may be charming whilst sipping a Chianti on a terrace admiring the view from the hills surrounding Florence, but the lack of elasticity in the fibres becomes rather tedious when it gets down to the practicalities of the work place. There is undoubtedly something honest and organic about it. And like silk, it is easily identified with the merest of touches and, for what it lacks in all-round convenience, it makes up for in character. For character is where linen really excels. I rather like to think of it as a tired and old grande dame; though creased and unrefined, still captivating onlookers with texture and spirit. What other material can be worn untucked and a little frayed and flabby at the edges? Cotton may be an excellent all rounder but compared to linen it is high maintenance. Cotton needs primping and fuss; a shirt or suit, otherwise respectable, is utterly ruined by evidence of the wearer’s repose. Linen is seemingly impervious to the negative effects of reclining. It certainly creases but somehow, it doesn’t matter. It looks acceptable. For the summer, the perfect linen shirt is essential. From providing cool protection from the brutal rays of sunshine to cutting a relaxed yet tasteful figure at the loggia restaurant, the linen shirt is such a comfortable choice at this time of year. The ideal linen shirt is not slim-fitting; somehow the crumpled elegance and manufactured fit do not sit well together. It should not be oversized and baggy either, although it is sensible to allow more than a little room between fabric and skin. Although linen shirts are fabulous in pinks, greens, azures and checks there is nothing quite like an ivory for freshness and versatility. 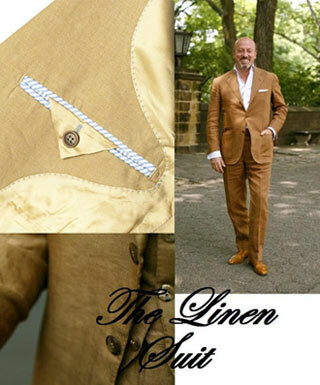 I believe that linen, whilst an outstanding material, should be worn in moderation. Therefore, wearing linen shirts with linen suits is pushing it a tad too far. Contrasts in texture are important – a light cotton shirt is a much better match for a linen suit. And a well made linen suit is a thing of robust beauty: there is something so indescribably luxurious about the way a floppy but tailored linen trouser falls against well-burnished shoe leather. Whilst they are more prevalent now in two button form, a well-fitting three button linen suit (creating the ‘X’ shape when the middle button is fastened) is also very elegant and, due to the fabric’s durability, it will serve the wearer well for many years. For the proverbial cherry, a woven silk pocket square would add a further Titian-esque dimension of texture to the ensemble. I am glad to see that you have tackled linen. As this is an article on linen, I am equally glad you mention patterned linen, such as seen with checks as well as colours. I also do not care for such things, I prefer the crispness that a solid ivory, or even straw colour provides. And as linen is popular in the sub-tropics, such as where I am in Palm Beach, I like very much that you selected an image of a gentleman wearing the right mix: a well proportioned linen suit, with his pocket square – properly ‘squared’ in its fold, with trousers breaking on well burnished leather. The ideal summer look. The pocket square here is critical. Any other shape in the pocket of a linen suit I feel sends off an unwelcome message of great affectation. Can you advise what colour shoes is more appropriate to wear with a white linen suit – black or white? If you are choosing between the two colours, black and white, I would strongly suggest white. Black shoes with white suits have that awfully unfortunate “I-don’t-own-a-pair-of-white-shoes” appearance; no matter how well polished they are. Light brown can look lovely with white linen suits too, but, if you are choosing on the monochromatic level, I would definitely advise white. If there is one thing worse than “not” owning a pair of white shoes – it “is” owning a pair of white shoes. Is a black shoe acceptable with white linen if wearing a white dress shirt, solid black tie, black belt etc.? if so, what colour of socks will be most suitable? That black shoes can be worn in such a context; accessorising with black tie, black belt etc, yes of course. Sock colour could be something bright like a peacock blue or chartreuse green? I have never understood the common aversion to white shoes. White shoes to me have always been elegant and a traditional ‘thing’ for summer. I know to some they represent Euro trash and golden toothed tax exiles in captain’s jackets and aviators but to me they have always represented an English country house summer party, or some elegant men pacing the deck of an old Pacific ocean liner.